The other day I responded to a sailor’s request for ideas on how to design a swim ladder for his high-freeboard boat. I posted some pics of the Amel swim ladder which, from what I have seen, is one of the best out there. That exchange inspired me to write this post, a list of our favorite Amel-isms, the features that are unique to this design of boat. When you spot a ketch on the water, the first tell-tale sign that it is an Amel is the hard dodger shielding the cockpit. While not the only model of boat that has such a thing, it is a feature that has remained constant through each of the Amel builds. Even though it is occasionally warm in the tropical sun, the dodger makes the cockpit feel very secure, offering excellent protection from the elements. The Amel’s hard dodger is very distinctive. I love KISS solutions, and the Amel’s water tank gauge is the epitome of that. It has no electronics to go bad, and no needles to get stuck. It’s just a rod with a float on the bottom which rises or falls with the water level, showing the volume remaining on an easy-to-read scale. Our Amel’s fuel gauge is almost as good. It’s simply a dip stick with fuel markings on it, attached to the diesel fill cap. If it could be read from inside the boat as the water gauge can, I’d consider it equally as cool. You can see the markings for the water tank gauge on the left edge of the top left image. a pin is slid into a hole from inside the boat, passing through the locker and its lid, preventing the latter from being raised. a cord, run between the lid and the locker is trimmed from inside the boat, and cleated off, preventing the locker from being opened. Super easy, and super smart. Note the cords and the cleats in the top left image. They are there to secure the bow lockers. When Amels switched from shaft drive propulsion to a type of sail drive (I think they call it a C drive), they lost what I feel is a very cool feature: the shaft alternator. When boats are sailing with the autopilot and other electronics running, there can be a big drain on the batteries. By allowing the prop to spin, our shaft alternator can keep juice coming into our batteries instead of letting us get into electrical debt. That is assuming we’re making at least 5 knots, of course. Edit: I have been informed that certain C drive models were also made with a shaft alternator. The Maramu bottom left could be charging its batteries while sailing. One of the best safety features on an Amel are its watertight bulkheads. Our Maramu has two: one blocking off the bow/chain locker, and a second blocking off the entire V-berth and forward head. I understand that newer models have also one blocking off the aft cabin. I had a surveyor tell me that he actually knew of one boat that put the V-berth bulkhead to the ultimate test. Not only did the boat remain afloat with the forward area flooded, it was also able to continue to make way! 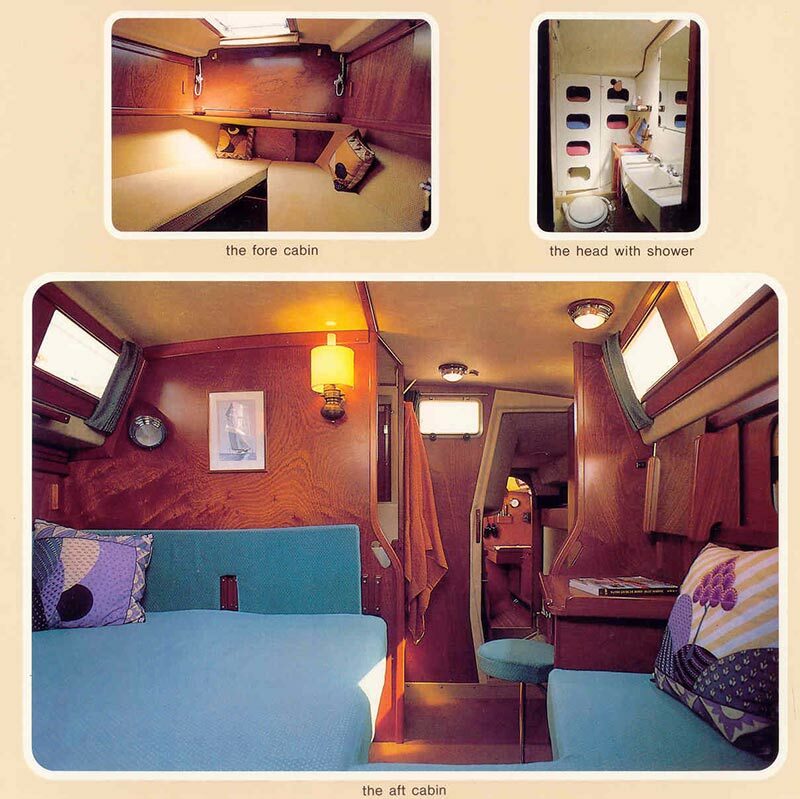 The top left image shows the V-berth’s water-tight bulkhead in its sealed position. While not quite as ingenious as the previous items, I love the Amel’s excellent engine room access. No one likes having to hang upside down to access important parts, or to use a mirror to see what’s happening on the non-service side of an engine. While some of that most certainly still does occur on an Amel, it is greatly reduced by the excellent access afforded by the huge engine room access door. The entire floor of the cockpit (top right) lifts up on a hinge to give access to the engine room. The Amel swim ladder is what got me started on this post, and it’s an amazingly well-designed piece of kit. With only one hand it can be moved from its stored position on the outside of the solid rail lifeline (which is also a cool feature) to the water. It can also be raised just as easily, pivoting on its attachment point. If that wasn’t cool enough, the ladder can also double as a passerelle for when the boat is med moored. A lot of thought went into that. 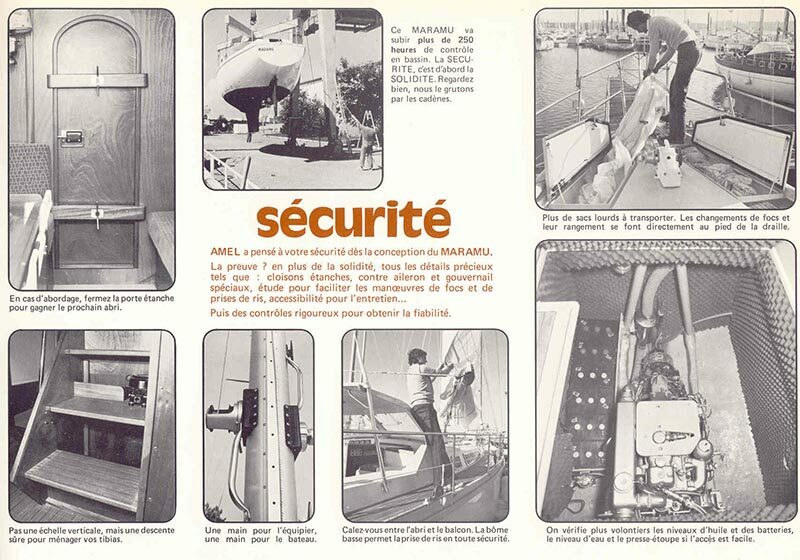 The three images on the left show the swim ladder raised, deployed, and mounted as a passarelle. 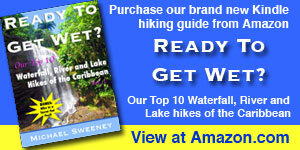 Note: All images are from original Amel brochures. Next PostWind Generator – Should you or shouldn’t you? There are plenty of them available. Great list and almost all of the reasons we bought our Super Maramu. A couple of points came to mind as I read it. – The Santorin and the Super Maramu did still have a shaft generator option even though they used the U-Drive (or C-Drive as some also call it). I’ve been on a few Santorin’s that had them, but I understand that very few of the Super Maramu’s were fitted with them. – Are your aft lazarette and engine room also watertight compartments? On the SM and Santorin they were and I thought they were on the Maramu’s also. – Isn’t the pole system on the Maramu very similar to the Super Maramu’s? If so, I’ve never seen an easier downwind pole system to deploy. Ours was easily a singlehanded operation which is quite impressive for a 50+ ft boat. Thanks for the info and the reminders. I wasn’t aware that any of the boats that had the U drive had shaft alternators. Now I know. 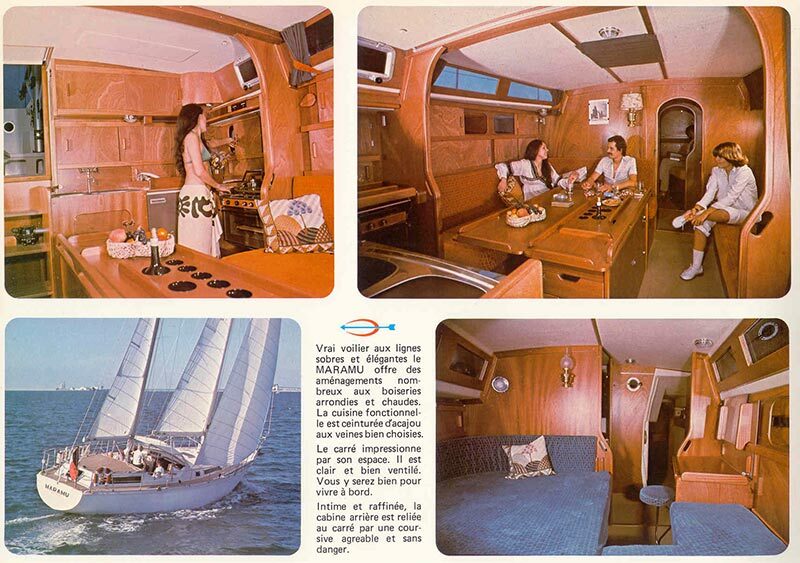 Our aft lazarette is nothing like the one on the super maramu. It is just a tiny locker, half the size of the ones in the bow. The engine room may very well be isolated from the rest of the boat though. The downwind pole system on the Amel is very unique. I’ve never used it which is why I hadn’t considered it. 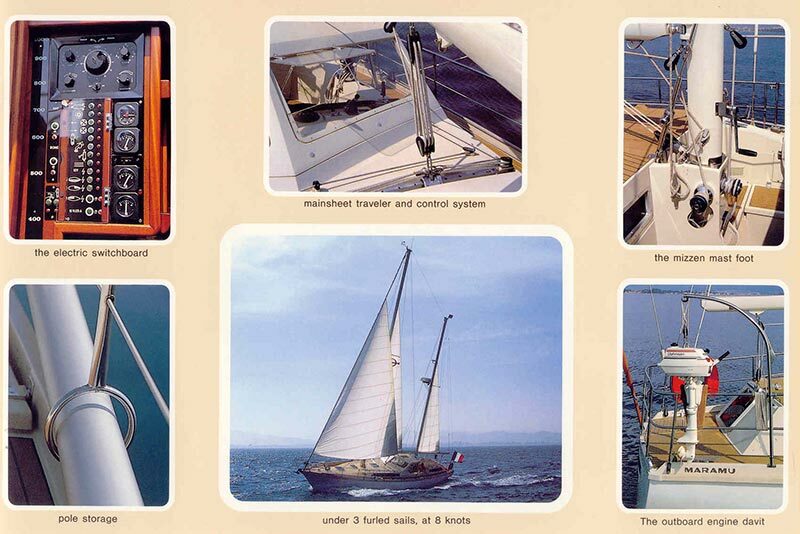 Our 1983 Amel does not have the articulating poles like the post 1985 boats. 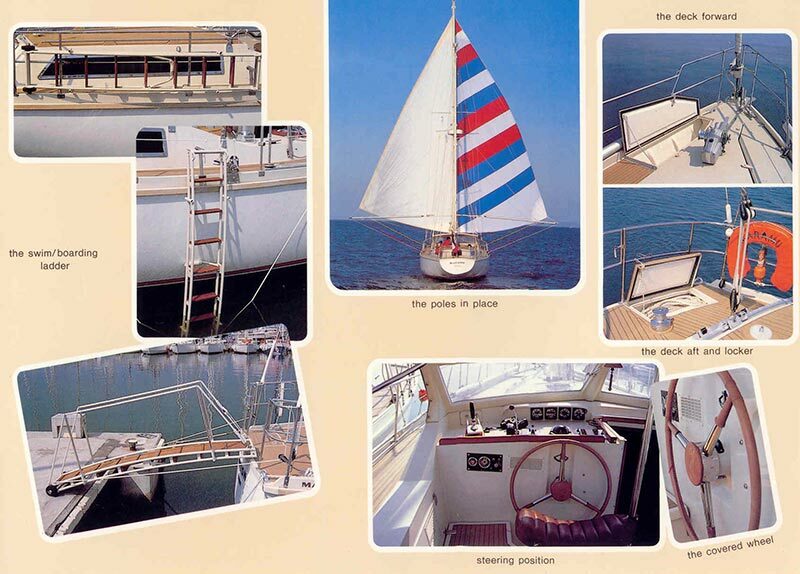 We do have two, and can run the dual headsails (although that too is different on our boat). I suspect it’s probably just a bit more difficult to set up. If we ever find ourselves going downwind, maybe I’ll try it. How does one tack with the extra sail forward of the mizzen mast? Wouldn’t the boom of the mainsail interfere? It does look cool as all hell though. I haven’t spent any time on ketches or yawls. Do you need to release the downhaul and sheet it back tight somehow to pull the luff out the way before tacking or jibing? Maybe it’s a perspective thing but it looks very funky to me having sailed mostly sloops and cutters. They made a ketch version of our HR-35 but I’ve never been on one. We don’t have a baby stay or running backstays even. There is nothing different about tacking ketch, or I suspect a yawl. 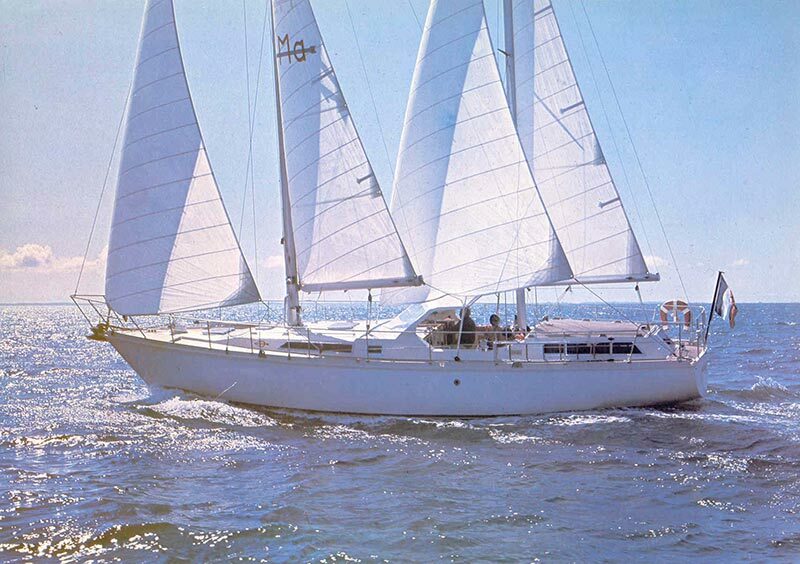 As for the mizzen staysail, it’s for light-air downwind sailing. I suspect you’d just douse it before gybing. We don’t have one. Amel also made a few sloop-rigged Santorins. To my knowledge, they were not that popular. That’s what I was thinking. The mizzen staysail might operate similarly to a small cruising asymmetrical spinnaker running off of the mizzen mast and midships instead of off the bow on a sloop. It’s just the strange look of it seemingly interfering with the boom swing of the mainsail. Is there actually a mizzen stay running forward to the deck that it hanks to? isn’t the guy between the two mastheads sufficient for forward tensioning of the mizzen mast? As for it being in the way, I suppose one could douse it every time one needed to change tacks. but it seems something that you’d only want to run if you were on a single downwind tack for a very long period of time. Still, it would be theoretically easier to douse than a spin running fore of the bow over the water. Again, everything I know about the mizzen staysail is theory, as we don’t have one. That said, we have a halyard for the head, and I believe the tack would attach to a padeye that we have on the deck near the mainsheet traveler. The tack would be sheeted to blocks by the stern cleats, and presumably then run back to winches in the cockpit. As you suggested, I think you’d only use it during a long, downwind run (reach). Love this boat. Is there a for sale site? Our boat is not for sale. Search Amel on Yachtworld.com, or Amel Maramu if you want one just like ours. The shaft drive alternator sounds clever, albeit requiring another alternator & set-up that would only come into play when sailing. However, I think I prefer having a wind generator installed in a location that will allow it to operate even when sailing. This can provide power at all times so long as there is wind blowing. I remember seeing my first Amel back in the 80’s and being impressed with that engine room and all the thoughtful detail stuff that you’re pointing out. 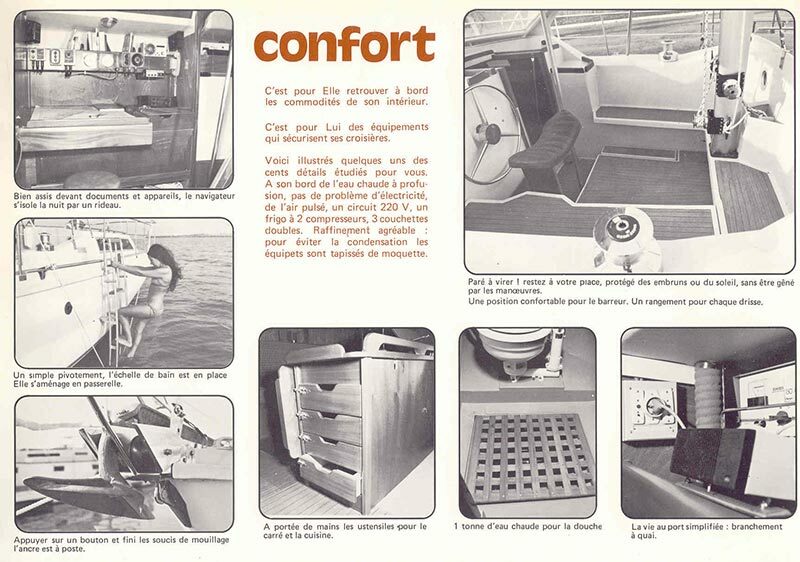 This boat was more than just ahead of its time because although some boat manufacturers appear to give thought to design details, most are still missing a lot of opportunities. Unless you’re weighing the cost of installing one, it doesn’t need to be an either/or thing. We have both the shaft alternator, and a wind genny. While I love the wind genny, and our batteries are full at this moment becuase of it, it does not work perfectly when sailing. Ours gets totally blocked by the mizzen when on a starboard tack. Additionally, since it’s going to turn based on the apparent wind, which is less than true when it is aft of the beam, it may not always give the results you’d hope for. Hey, there is one for sale in Kingston, Ontario! I doubt my answers will be of very much help to you. 1. I don’t know. We cleaned the water tank and could see no bolts that I recall. 2. No. I was not aware of that upgrade but was quite happy with the original system. 3. No, and I can’t measure for you as I’m not on the boat. I should also mention that I have been on several older Maramus and they each had a different refrigeration system. I don’t believe ours is original.